YANGON -- Competition in Myanmar's mobile phone market is getting fierce. With sustained downward pressure on prices, the industry fears it could squeeze itself out of profitability. And things could get worse. Last July, Myanmar's Ministry of Communications and Information Technology said it would invite bids for a fourth mobile phone operator's license. At first, the apparent winner was Yatanarpon Teleport, or YTP, an Internet service provider. But the company found it difficult to finance the necessary infrastructure. Base stations and other pieces of the network would cost at least $1 billion. YTP then decided to team up with foreign telecom companies. The ministry welcomed the idea and decided to grant the license to a joint venture between a consortium of 11 Myanmar companies, with YTP at its core, and a foreign company. Seven overseas concerns, including Singapore Telecommunications and China Telecom, showed immediate interest. But by the March 18 deadline, only the Viettel group of Vietnam had submitted a business plan, and the ministry granted it preferential negotiating rights. Viettel, YTP and its partner companies are to soon launch joint-venture talks. 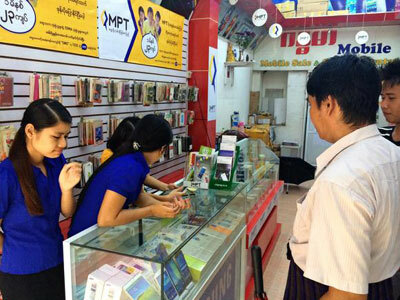 Under military rule, state-owned Myanma Posts and Telecommunications, or MPT, dominated the country's wireless market. In a bid to quickly boost mobile penetration, the government held its first mobile license auction in the summer of 2013, allowing foreign companies to bid. Qatar's Ooredoo and Norway's Telenor won the auction and began providing services the following year. MPT then teamed up with Japan's KDDI, a telecom company, and Sumitomo Corp., a trading house. With three competitors, prices and fees have fallen significantly. The price of a SIM card has dropped from a few hundred dollars to 1,500 kyat ($1.27). The per-minute charge for phone calls has fallen from 50 kyat to 20-30 kyat. The competition is no longer sustainable, an industry representative said.